Connelly, M.p.. "Women in the Labour Force". The Canadian Encyclopedia, 09 January 2018, Historica Canada. 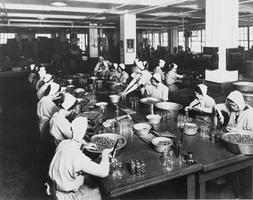 https://www.thecanadianencyclopedia.ca/en/article/women-in-the-labour-force. Accessed 18 April 2019. Women are considered LABOUR FORCE participants only if they work outside the home. In the past women have been expected to be in the labour force only until they marry; this reflects the historical, idealized notion of a society in which the man is the breadwinner and the woman the homemaker. Women packing olives for McLarens, Hamilton, Ont, c. 1920s (courtesy Library and Archives Canada/C-36971). 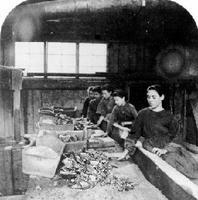 Women workers sorting copper ore in Bolton, Québec, 1867 (courtesy McCord Museum). Women are considered LABOUR FORCE participants only if they work outside the home. In the past women have been expected to be in the labour force only until they marry; this reflects the historical, idealized notion of a society in which the man is the breadwinner and the woman the homemaker. This notion of the FAMILY has not been a reality in the past and is not so today, since more than half of all married women work outside the home, but the idea that women belong in the home has had a significant effect on the conditions under which they participate in the labour force (seeMARRIAGE AND DIVORCE). That participation is characterized by segregation and low pay. The majority of women in the labour force have always been isolated in "female" occupations, called such because they are often extensions of the work women do at home and because the vast majority of the people doing them are women (see STATUS OF WOMEN). Some occupations have changed over time and new ones have come into existence, but various occupations are still defined as women's work. Today women have one unpaid job in the home and one low-paid job in the labour force. Women have always been responsible for work in the home and in the labour force and they have always been paid lower wages than men; they have been paid less both when their jobs are not the same as those of men but could be seen as equally valuable and when the work is exactly the same (see WORK). Women earned 52.8% of what men earned in 1911, 58% in 1971 and 66% in 1996. At the end of the 19th century, the factories replaced families as the main productive unit. Factory work involved long hours, low wages and often brutal working conditions. For example, young girls worked for 60 hours a week for 80 cents, or less than 2 cents per hour. In 1901 women comprised 13% of the total labour force and the female labour-force participation rate (FLFPR, defined as that proportion of working-age female population with jobs or looking for jobs) was 14% (this refers to women who worked for pay; many women worked but were not paid). The majority of women were employed as servants, dressmakers, teachers, seamstresses, tailors, housekeepers, launderers, milliners and saleswomen. During the first half of the 20th century, the number of jobs available to women was limited and strong sentiment existed against married women working outside the home. Men feared that the cheap labour of large numbers of women would undercut their wages; employers and moral reformers were concerned that work would impair the femininity and high moral standards of women and distract them from their true calling as wives and mothers. During WWI, women replaced men who had joined the armed services, but the labour shortage was not severe enough to warrant their large-scale employment. Although women did men's jobs, they did not receive men's wages. At the end of the war, women were strongly encouraged to leave the work force and married women employed by government were legislated out of it. By 1921, 65% of all women workers were in clerical, domestic service and professional (mainly teaching and nursing) occupations. In the early part of the 20th century, women's fight for equality focused on political rights and was characterized by the suffrage movement. The right to the federal vote was finally won in 1918, and by 1922 women had won the right to vote in all provinces except Québec, where the struggle continued until 1940. In 1929 women were recognized as "persons" eligible to hold a seat in the Canadian Senate (see PERSONS CASE). The expansionary period of the 1920s was cut short by the Great Depression, but production and employment expanded enormously with WWII and once again employers hired single and then married women to do men's jobs, once again for lower wages. Incentives, eg, free government nurseries and income-tax concessions, were provided to attract married women into the labour force. At the end of the war the incentives were withdrawn and married women were again encouraged and in some cases regulated out of the labour force. This time, however, many stayed and found employment in the expanding number of "female" jobs in the service industries. The greater numbers of women entering the labour force presented male-dominated trade unions with a dilemma. Trade unionists feared the competition from "unskilled" female labour and were concerned as well with maintaining the traditional role of women. Simultaneously, they were interested in protecting all workers, including women. Women workers, however, with or without the support of the trade-union movement, have traditionally fought for higher wages and better working conditions (see WORKING-CLASS HISTORY). The 1950s were a time of rapid economic expansion. Changes in the productive process, emphasis by government and private industry on construction and on research and development, expansion in health, welfare and educational services, and the need to advertise, sell and finance new products all created new jobs for women. 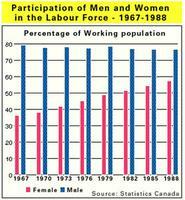 By 1951 women comprised 22% of the total labour force and the FLFPR was 24%. As the economy developed and as labour's productivity increased, consumer goods, cheaper in price, became available to more people. Mass consumption of these goods was imperative to the economic system. By mid-20th century many families, to be able to afford more goods and to educate their children, needed 2 income earners. Because young people were staying in school longer, married women entered the labour force to help their families raise their STANDARD OF LIVING. Between 1951 and 1994 the FLFPR of married women rose from 11% to 57.6%. Since the 1950s there has been a steady increase in part-time work and by 1994 the number of part-time jobs, which have few benefits and little security, had expanded enormously; 69.4% of these were filled by women. Women continued to earn lower wages than men and in 1980 the average wage rate for full-time women workers was 64% of that of the average wage rate for men workers. By 1993 women's wages had increased somewhat and men's wages had declined, narrowing the gap between their earnings to 72%. In 1994, 70% of women were still employed in clerical, sales, service, teaching and nursing and health-related occupations; women comprised 43% of the total labour force and the FLFPR had risen to 52%. From 1971 women organized to demand greater equality in wages and working conditions, and to gain recognition of their social, economic, legal and political position in society. The women's movement of the 1960s had made many women aware of their right to independence and control of their own lives. Women joined unions and other organizations in greater numbers. The women's movement also raised and debated issues such as wages for HOUSEWORK, pensions for housewives and public child care. Considerable agreement existed in a wide range of areas: the prohibition of discrimination in employment policies on the grounds of gender or marital status; affirmative action; equal pay for work of equal value; maternity leave and benefits; adequate DAY CARE facilities; provision for health and safety; and protection against sexual harassment in the workplace. By 1994, 57% of mothers with children 5 years and under were in the labour force and the crisis in child-care services was a major issue. As the need for the 2-income earner family increases, so too does the demand for parental leave and quality day-care programs that recognize women's role in the labour force and men's role in child rearing and household work. The notion, which has not changed, that there is a male breadwinner to support every household reinforces the occupational segregation and low wages of women in the labour force. In 1992, 61% of 2-parent families had both spouses employed. Without the wives' earnings, 16% of these families would live below the low-income cut-off (spends more than half of income on food, shelter and clothing). Wives' earnings represented 31% of the income of dual earner families. Many female single parents do not earn enough to live on after child care and other costs of working outside the home are deducted. In 1993, 60% of all families headed by lone parent mothers had incomes that fell below the low-income cut-off. Fifty-six percent of elderly women also live with low incomes; because most of these women worked all their lives in the home they have no work-related pension of their own. Husbands' pension plans seldom provide adequate protection for their surviving wives. Government restraint has increased unemployment and decreased necessary services in health, welfare and education making it increasingly difficult for these groups (see POVERTY). Since the deep recession of the 1980s, real wages and consequently the standard of living have been declining. Economic setbacks and restructuring by government and the private sector has resulted in a decline in the number of full-time jobs and an increase in part-time work. By 1994, 23% of all jobs were part-time and rates for women remained relatively constant at 69%, although some men moved into part-time jobs. Between 1976 and 1994, the percentage of involuntary part-time work tripled from 12% to 36%, and 34% of part-time women workers wanted full-time work in 1994. This also meant that many people were forced to hold more than one job to earn a living. In 1994, women, especially young women, had higher rates of multiple job holding than men (see WORK). Achieving this goal would require major social, political and economic changes in order to create structures such as parental leave and child-care programs that support women and overturn existing structures such as labour-force segregation and low wages that are disadvantageous to women. It would also require changes in attitudes that divide work in the labour force and work in the home into "women's" work and "men's" work. As government services are cut back many of the higher-paying jobs for women disappear. New jobs based on new technologies will strand many women at home in "high-tech" sweatshops - a modern incarnation of the traditional piece-rate work for which little legislation exists. Without adequate government services, the care of children, the elderly, the disabled and the unemployed will once again fall on the shoulders of women, who are still generally considered responsible for this work. It appears, therefore, that women's work in the home is expanding, although it is increasingly necessary for women to be income earners, either as sole supporters of single-parent families or as members of 2-parent families. In this context, women's struggle for equality becomes even more difficult. Yet the struggle continues, as many women try to reach the goal of a society where women and men equally combine and share work and family responsibilities.